Hundred-and-Fifteenth Sidra՚, the spirit given to the Seventy Elders, the quail, and Miriam and Aaron complain. Hundred-and-Twelfth Sidra՚ (Num. 8:1-9:23): The lighting of the Menorah, the inauguration of the Levites, the Passover in the wilderness, and the Cloud. Every evening Aaron - and every subsequent Kohen Gadol [High Priest] - is to light the Menorah, and position its seven lamps so that their light is cast towards the front of the Menorah. YHWH commands Moses to inaugurate the Levites as 'assistant priests', but first they must be purified. In order to be purified the Levites need to be sprinkled with the Water of Decontamination from Sin, shave their entire bodies with a razor, and launder their clothes. Afterwards the Levites are to bring to the Tent of Appointed Times for a collective offering: one young bull and its gift-offering of flour mixed with oil, and a second young bull for a sin-offering. Next, the Levites are to be brought to the Tent of Appointed Times where all the Community of the Children of Israel is to be assembled, and before YHWH, the Children of Israel are to lean their hands upon the Levites. Aaron is to present the Levites as an elevation-offering before YHWH on behalf of the Children of Israel. Then the Levites are to lean their hands on the head of the bulls; one bull for a sin-offering and the other for an ascent-offering, in order to make atonement for their sins. "And you shall separate the Levites, from the midst of the Children of Israel; and the Levites shall be Mine" (Num. 8:14). Moses, Aaron and all the Community of Israel inaugurate the Levites as YHWH commanded. After their purification and inauguration, the Levites are permitted to serve in the Tent of Appointed Times in place of the firstborn of the Children of Israel. "For mine are all the firstborn of the Children of Israel, among man and among beast; on the day that I smote the firstborn in the land of Egypt, I sanctified them to Me" (Num. 8:17). The Torah informs us that at twenty-five years old the Levite is to join the work force serving in the Tent of Appointed Times, and is to retire at fifty years old. However, in Parashat Naso՚ the age given for the Levite to commence serving in the Mishkan is thirty years old. The type of work that the Levite undertook at each age group can account for this discrepancy. Here the Torah states that the Levite begins 'serving' in the Mishkan at twenty-five years old (which would include guard duty), while in Parashat Naso՚ the Levite commences performing mela՚kha (work that is productive or creative) in the Mishkan at thirty years old. Even though the Levite retires from serving in the Mishkan at the age of fifty, he can continue to be part of the Tent of Appointed Times' guard duty roster. 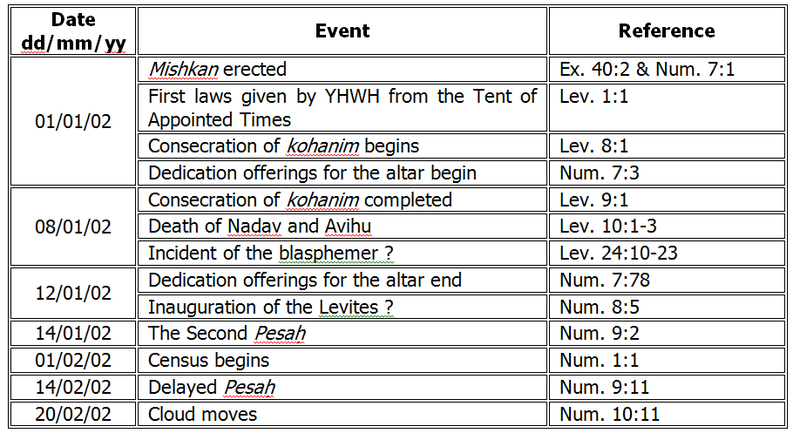 It is now approaching the time for the Pesaḥ offering, the second one in the history of Israel. YHWH reminds Moses to tell the Children of Israel that they are to offer the Pesaḥ at its appointed time; on the fourteenth day of the First Month at twilight. When they sacrifice the Pesaḥ the Children of Israel must adhere to all its regulations. The Children of Israel obey YHWH's command and offer the Pesaḥ at its appointed time in the Wilderness of Sinai. However, some men having become impure through contact with human dead are unable to sacrifice the Pesaḥ offering. It is very possible that the men spoken about are in fact Misha՚el and ՚Elṣafan the cousins of Moses and Aaron who carried out the charred bodies of Nadav and ՚Avihu from the Mishkan on the eighth day of the First Month. The men approach Moses and Aaron on the day of the offering of the Pesaḥ and say to them, "We are impure by a dead human; why are we restrained so as not to bring near the sacrifice of YHWH in its appointed time, in the midst of the Children of Israel" (Num. 9:7). Moses tells them to stand by while he inquires from YHWH regarding their situation. YHWH tells Moses that if anyone from the Children of Israel is impure through contact with human dead or is on a long journey, then they are to offer the Pesaḥ on the fourteenth day of the Second Month at twilight and to eat it with maṣṣoth [unleavened bread] and bitter herbs. The same rules and regulations that apply to the Pesaḥ of the First Month are also applicable to the secondary Pesaḥ. If a man is pure or is not on a journey and fails to offer the Pesaḥ then he is to be cut off from the Children of Israel. "And if a Sojourner shall sojourn with you and offers the Pesaḥ to YHWH, according to the law of the Pesaḥ and according to its judgement thus he shall do; one law there shall be for you and for the Sojourner and for the citizen of the land" (Num. 9:14). On the day that the Mishkan was erected the Cloud descended and covered it. Everyday the Cloud would cover the Mishkan and at night, there would be the appearance of fire until the morning. When the Cloud lifted up from the Mishkan the Children of Israel would journey on, and where the Cloud settled, there they would encamp. For as long as the Cloud covered the Mishkan the Children of Israel did not journey on, but remained where they were. "At the order of YHWH they encamped, and at the order of YHWH they journeyed; the charge of YHWH they kept, at the order of YHWH by the hand of Moses" (Num. 9:23). Hundred-and-Thirteenth Sidra՚ (Num. 10:1-11:15): The trumpets, departing from Sinai, Ḥovav - Moses' brother in law, journeying on, and complaints. The Israelites are to make two silver trumpets of hammered work. The trumpets are to be blown by the kohanim in order to call the Community as well as a signal for the encampments to continue on their journey. When the kohanim blow both trumpets all the Community is to gather at the Tent of Appointed Times, but if only one trumpet is blown then only the Nesi՚im [pl. of Nasi] are to gather. If the kohanim give a shouting-blast on the trumpets then the encampments encamped on the east are to journey on, and on the second shouting-blast the encampments encamped on the south are to do likewise. When we are settled in the land of Canaan and an enemy attacks us declaring war upon us, "then you shall give a shouting-blast on the trumpets; and you shall be remembered before YHWH your God, and you shall be saved from your enemies" (Num. 10:9). On the days of our rejoicing i.e. holy days, appointed times, and new moons, we are to blow the trumpets over our ascent-offerings, wellbeing-offerings, and as a reminder before God. In the second year on the twentieth day of the Second Month the Cloud ascended from above the Mishkan of the Testimony. The Children of Israel journeyed on from the Wilderness of Sinai, and the Cloud came to settle in the Wilderness of Paran. The tribes of Israel journeyed according to the order of their encampments. The first to break camp was the eastern encampment: Judah, Issakhar, and Zevulun. Once the Mishkan had been dismantled, the Sons of Gereshon and the Sons of Merari march out carrying the Mishkan. The next to break camp was the southern encampment: Reuben, Simeon, and Gad. Then marched out the Ḳahathites carrying the holy vessels, and when camp was pitched they would erect the Mishkan. The Ḳahathites were followed by the western encampment: Ephraim, Manasseh, and Benjamin. The last encampment to march out was the northern encampment guarding the rear: Dan, Asher, and Naphtali. Before the Israelites depart from the Wilderness of Sinai Moses approaches the brother of Zipporah his wife, Ḥovav son of Ruՙu՚el (רְעוּאֵל = Jethro [יִתְרוֹ - His Excellency] the Priest of Midian) the Midianite and invites him to come to the land of Canaan with them. Ḥovav refuses the offer and tells Moses that he would rather return to his own land and household. Moses tries to persuade Ḥovav not to leave them and asks him to become their guide telling him, "And it shall be if you go with us; and it shall be that good which YHWH shall do goodly for us then we will do goodly to you" (Num. 10:32). They journey a three days journey from the mountain of YHWH with the Ark of YHWH's Covenant going before them - scouting out a place to camp. While they journeyed the Cloud of YHWH would be over them by day. Whenever the Ark journeyed on Moses would say, "Arise YHWH and Your enemies shall scatter, and those who hate You shall flee from before You" (Num. 10:35). And when the Ark came to rest he would say, "Return YHWH, to the myriads the thousands of Israel" (Num. 10:36). The people began to complain, and their complaints were evil in the ears of YHWH. His anger flared up and the fire of YHWH burnt amongst them, consuming the edge of the camp. The people cried out to Moses so he prayed to YHWH, and the fire died down. Because of this they named the place Tavՙera [תַּבְעֵרָה - Burning], however we are not told the nature of their complaint. Some of the mixed multitude in the midst of the Children of Israel have a great craving for meat, the craving spreads to the Children of Israel who cry for meat to eat. They complain that in Egypt they ate fish for free, cucumbers, watermelons, leeks, onions, and garlic! But now their souls are dry - so they complain - for there is nothing to eat except for the man [manna], "And the man, is like the seed of coriander; its aspect like the aspect of bedolaḥ" (Num. 11:7). The Torah informs that at night the man would come down and settle on top of the dew. In the morning, the people would glean the man and grind it in millstones or crush it with a mortar before cooking it and making it into cakes that tasted like dainty oil cakes. Moses heard the people weeping by their clans outside their tents and YHWH's anger flared up exceedingly; and it was evil in the eyes of Moses. Moses turns to YHWH and wants to know why He has done evil to His servant, and why he hasn't found grace in YHWH's eyes, since it was He who placed the burden of the entire people on him. Moses states that he did not conceive this people nor did he give birth to them, so why does He say to him, "Carry it in your bosom like a nursing father carries the suckling child, to the soil, that You swore to their fathers" (Num. 11:12). Moses wants to know when the people cry to him because they want him to provide them with meat, from where will he acquire the meat? Moses tells YHWH that he is not able to carry this people alone for they are too heavy for him. If this the way He deals with him, then - if he has found grace in YHWH's eyes - it is better that He kills him. Hundred-and-Fourteenth Sidra՚ (Num. 11:16-22): The promise of meat. YHWH commands Moses to gather for Him seventy men from the Elders of Israel and to take them to the Tent of Appointed Times. There YHWH will descend and speak to Moses and will withdraw some of the spirit that is upon him and place it upon the Elders. They will then carry along with Moses the burden of the people, so that Moses will not have to carry it alone. Moses is to tell the people that they are to sanctify themselves for tomorrow YHWH will give them meat to eat, since they complained in the ears of YHWH about there not being meat to eat and how it would have been better for them if they had stayed in Egypt. They will eat meat not for one day, two days, five days, ten days or even twenty days, but for a full month until it comes out of their noses and becomes loathsome to them. YHWH will punish them because of their complaints about leaving Egypt, which are tantamount to rejecting Him who is among them. Moses is still not sure how YHWH will provide a month's supply of meat for the entire nation, "If the flock and herd is slaughtered for them would it suffice them; if all the fish of the sea are gathered for them would it suffice them" (Num. 11:22). Hundred-and-Fifteenth Sidra՚ (Num. 11:23-12:16): The spirit given to the Seventy Elders, the quail, and Miriam and Aaron complain. "And YHWH said to Moses, is the arm of YHWH (too) short; now you shall see whether My word happens to you or not" (Num. 11:23). Moses speaks to the people and tells them the words of YHWH. He gathers seventy men from the Elders of the people and stations them around the Tent. Whether these are the same seventy Elders as the seventy Elders, who along with Moses, Aaron, Nadav, and Avihu beheld a vision of YHWH on Mt. Sinai is unsure. YHWH descends in a cloud and speaks to Moses. He withdraws some of the spirit that is upon Moses and puts it upon the seventy men of the Elders. When the spirit rests upon the Elders they began to prophecy, however their prophetic state was only a temporary one. Two men, ՚Eldad and Meidad, who had been recorded amongst the Elders did not go to the Tent but remained in the camp, and the spirit rested upon them. ՚Eldad and Meidad began to prophecy in the camp; a certain youth ran and told Moses. Upon hearing this Joshua son of Nun who had been Moses' assistant since his youth, speaks to Moses requesting that he restrain them. However, Moses responds, "Are you jealous for me; and who would give that all the people of YHWH were prophets, that YHWH would put His spirit upon them" (Num. 11:29). Moses and the Elders of Israel return to the camp. Then a wind travels from YHWH cutting off the quails from the sea so that they fall all around the camp a day's journey in every direction and about two cubits deep upon the face of the ground. All that day, day and night, and even all next day the people gather the quails - the least that was gathered was 10 ḥomers [חֹמֶר - between 220 and 450 litres - dry weight] - spreading them out all around the camp. The meat was still between their teeth, not yet cut off, when YHWH becomes furious with them and smites them with an exceedingly great smiting. The people call the name of the place Ḳivroth Hatta՚awa [The Graves of the Lust], for there they buried the people who lusted. The people journey on from Ḳivroth Hatta՚awa to Ḥaṣeroth and there they encamp. Miriam and Aaron speak up against Moses because of the Cushite woman whom he had married. Some commentators believe that this Cushite woman was not identical to Zipporah and was in fact another woman that Moses had married. "And they said is it only through Moses that YHWH speaks, is it not also through us that He speaks; and YHWH heard" (Num. 12:2). Miriam and Aaron are challenging the leadership of Moses and using his Cushite wife as a pretext to attack him. The Torah informs us that the man Moses was very humble, more humble than any other human on the face of the earth. This fact is probably mentioned here as an indicator that Moses did rise to Miriam and Aaron's challenge but held his peace. Then YHWH suddenly tells Moses, Aaron, and Miriam, that the three of them should go to the Tent of Appointed Times. There YHWH descends in a column of cloud and calls Aaron and Miriam and says, "Please hear My words; if there shall be among you a prophet, I YHWH will make Myself known to him in a vision, in a dream I speak with him. Not so My servant Moses; in all My house he is trusted. Mouth to mouth I speak with him and (by) appearance and not in riddles, and the form of YHWH he beholds; so why were you not afraid, to speak against My servant against Moses" (Num. 12:6-8). YHWH becomes extremely angry with them and departs. As soon as the cloud ascends from above the Tent, Miriam becomes covered with Ṣaraՙath, her skin resembling snow. Aaron confesses to Moses that he and Miriam had sinned against him, and had thus acted foolishly. Aaron pleads with Moses that Miriam should not be like a stillborn child whose flesh is half consumed. Moses cries out to YHWH to heal Miriam with these simple words, "God, please heal her please" (Num. 12:13). YHWH responds if Miriam's father had spat in her face she would have been ashamed for seven days. Therefore, she is to be shut up outside the camp for seven days and then she may return. While Miriam is shut up outside the camp, the people do not journey on. Once Miriam is brought back into the camp, the people journey on from Ḥaṣeroth and encamp in the Wilderness of Paran. Parashat Bahaՙalotekha reeks of insurrection and rebellion. The mentality of "we want, and we want it now" caused by the feeling of being unsure about the moment and the environment, leads into a sense of insecurity about tomorrow. This "slave mentality" did not abate at Mount Sinai after the incident of the Golden Calf, but due to generations of servitude had become, in a way, part of the genetic make-up of the people. Like caged animals, the people expect everything to be brought to them rather than them having to earn it. This state of mind had such a strong grip on the Children of Israel that even after witnessing the plagues that befell Egypt, the crossing of the Sea of Reeds, and the Revelation at Mt. Sinai, it could not be purged from their collective psychological mindset. They complain, and their complaint is evil in the ears of YHWH, which causes His anger to flare up so that the fire of YHWH burns amongst them consuming the edge of the camp. Did they learn; no! Like the insane man going through the same action time and time again but expecting different results, the people repeat the same mistake and once again provoke Him to anger. Nothing is good enough for them, not even the man sent from heaven. So, as the adage says, "be careful what you wish for", YHWH sends a flock of quail - enough to feed the entire people for a month. Some of the people descended upon the quail like lustful animals gorging themselves on the flesh that had, "not yet cut off" (Num. 11:33) i.e. the birds were still alive when they were consumed. A plague breaks out amongst those who acted like wild animals rather than as redeemed humans. YHWH sent the plague because of His revulsion towards them due to their lack of trust in Him, which materialised into a rebellion and an obscene animal like craving for flesh. Once again, the Children of Israel are in the process of redemption. Being purged of the mentality that due to almost 2,000 years of Exile and persecution has been impregnated within their psyche. And once again after He has brought us back to our Land and restored the Holy City to our rule, we as a people reject His ways and continue upon a road paved with ingratitude. Like someone hitting their own hand with a hammer and wondering why their hand hurts, so are we when we turn our collective backs on Him and wonder why He afflicts us. If we deserve to be called His chosen people - His special treasure, then we need to place our undivided trust and loyalty in Him and not yearn to return to the Egypts of today where we live in servitude; not as a redeemed people basking in His Glory.